"It can be hard to determine the exact cause of every case of conjunctivitis. This is because some signs and symptoms of the condition can differ depending on the cause, and other signs and symptoms are similar no matter what caused the conjunctivitis. Sometimes there are situations that can help your healthcare provider determine what is causing the conjunctivitis. For example, if a person with allergies develops conjunctivitis when the pollen count increases in the spring, this would be a sign that he or she might have allergic conjunctivitis. 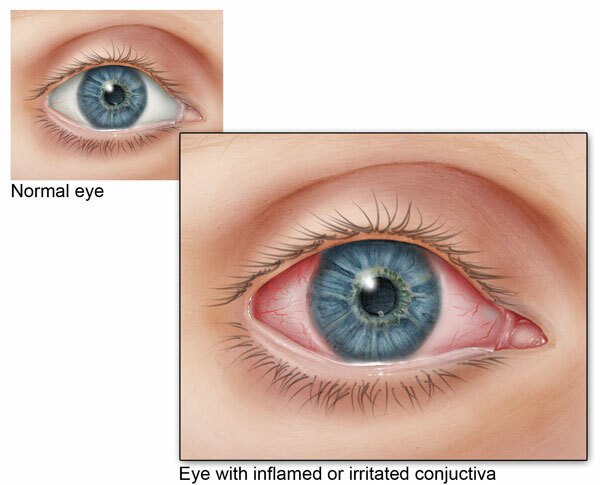 And if someone develops conjunctivitis during an outbreak of viral conjunctivitis, this would be a sign that he or she might have viral conjunctivitis." Wash hands after applying eye drops or ointment...."